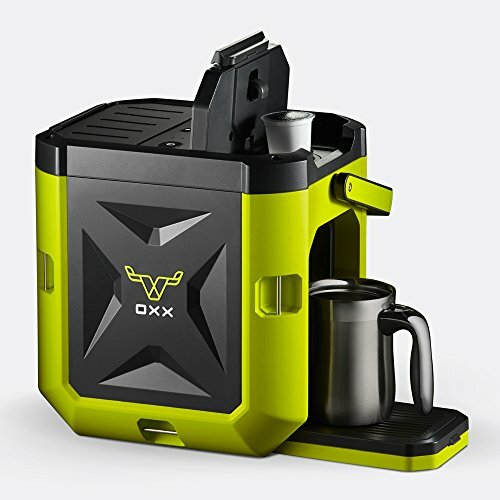 You can be your own barista with portable coffee maker even in the middle of nowhere. Craft the perfect crema-topped cup of coffee without having to go to Starbucks or having to buy a jar of instant again. Avoid that painful moment of being forced to consume whatever coffee is available on the road between destinations. True coffee aficionados always travel prepared. While some people have been known to carry a full-size coffee maker in the back of their SUV, the portable coffee machine makes more sense. So, whether you’re a frequent road tripper, a camper, or you make your living on the road, look below mentioned best portable coffee makers and find the right one for your needs. This portable coffee maker has been designed by the same guy who invented the Aerobie (the Frisbee-alternative children’s toy). 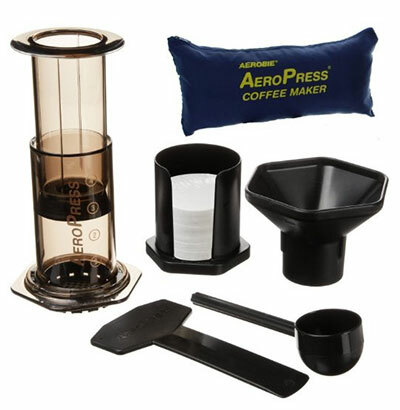 The Aeropress is frequently described as the best cheap portable coffee maker on the planet. It costs only about $30 and consists of series of tubes. It reduces the amount of time the ground coffee remains in contact with hot water (down to about a minute, instead of the usual three or four), thereby eliminating the acidity and bitterness associated with over-brewed coffee. It brews a strong, smooth, concentrated shot or two of flavorful coffee. The parts aren’t small, but they’re all lightweight, made from plastic and the scoop and stir stick can be stored in the upper hollow tube during transport. The Impress is even more portable than the Aeropress. It consists of only three parts, while also doubling as its own travel mug which makes it even more portable. The Impress has a finer mesh, thus giving you more flavor by allowing you to grind to a finer consistency. It also blocks tiny particles from escaping into the drinkable section. The outer chamber is double-walled, insulating the coffee to keep it warm. The lid is more of a heat-retaining cover, rather than a leak-proof screw-on. It’s best to think of this as more of a desktop travel coffee maker, rather than one that can be thrown in a bag alongside a fancy laptop. French press brewing usually won’t produce something as strong or clean as some other methods, but it still has many fans. 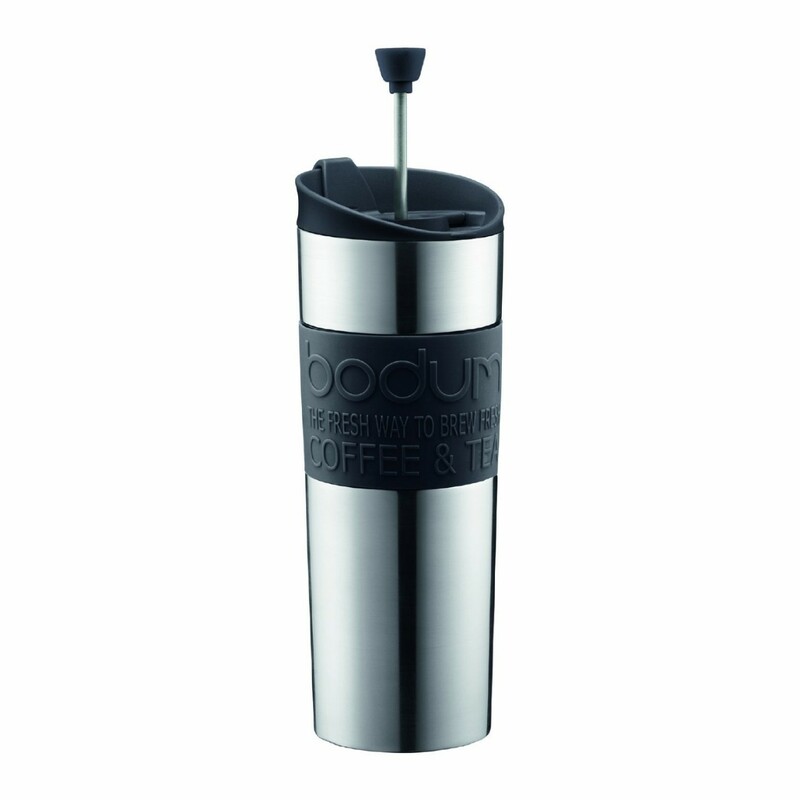 It’s also a perfect portable design that can function as its own insulated travel mug. 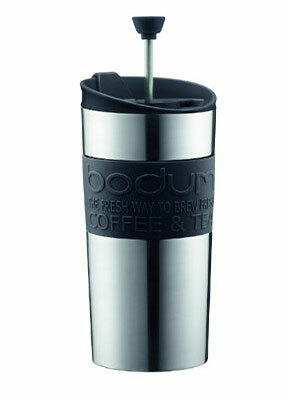 Pictured is the Bodum stainless steel insulated French press travel coffee mug. It is an attractive model with a sippy spout for drinking coffee on a bumpy bus ride. Starbucks also makes a nice variation with a screw-top closure, which is likely to be more popular with people who like to throw things into a bag right next to important documents and electronics. Handpresso has been around for a while. It has two major products. 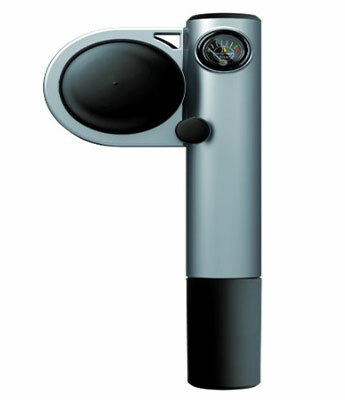 A pump-operated version and an electric version that plugs into a car’s cigarette lighter. Car version is little more expensive than the standard version and requires an additional adapter to plug it into a regular outlet. 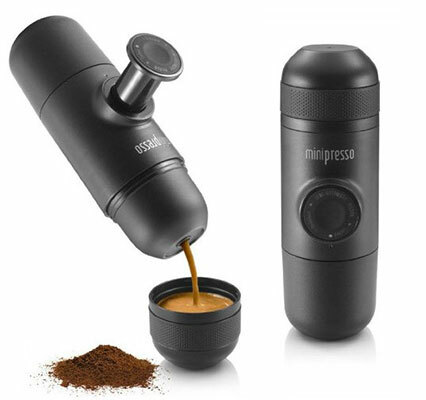 I think the standard version of Handpresso portable coffee maker is likely to be more versatile. Just a few pumps, coffee, and hot water, and you’ve got espresso, with no additional electricity needed. Despite being a more complex system than the regular coffee makers shown above, it’s still quite small, and easily portable. They even make a travel case for extra protection. This one is very attractive and convenient. 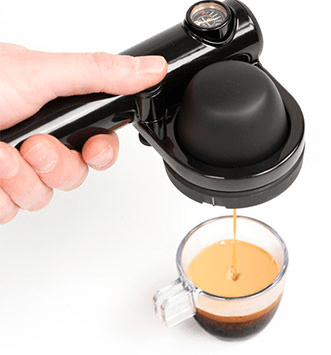 It’s lighter than the Handpresso and has simpler pump mechanism, plus an included cup. The only disadvantage (if you consider it as a con) is that it produces coffee under 8 bars of pressure, compared to the Handpresso’s 16. This is not a deal breaker for anyone, but worth mentioning, especially since “official” espresso typically requires 9 bars. 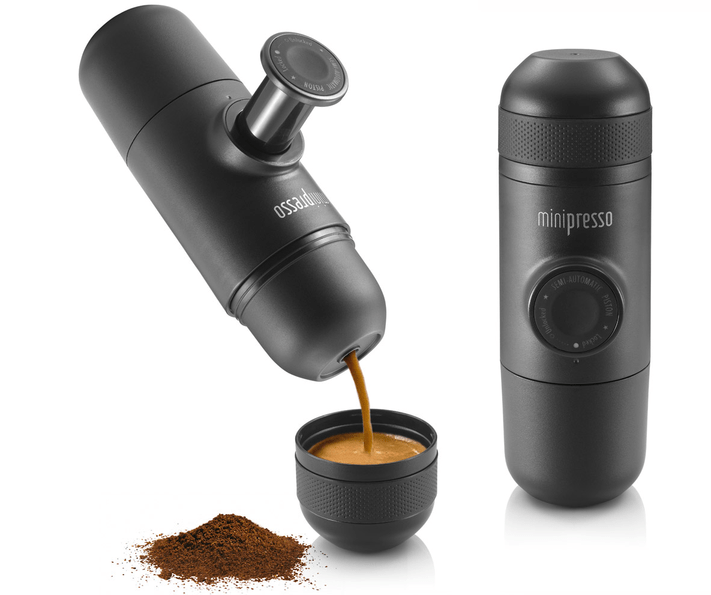 Minipresso currently comes in two versions. One for ground coffee, and one for pods (and there are only two approved pod brands for the pod version). The ground coffee version is more versatile, while the pod version is more convenient. 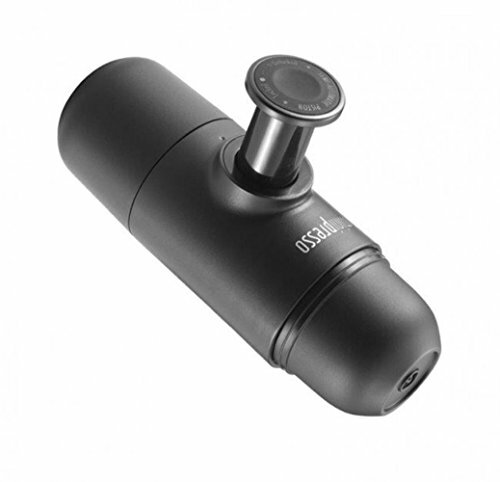 # A manual coffee grinder will allow you to grind on demand, wherever you are. Manual grinders do take some time to operate (particularly for a finer grind), but it’ll give you a minor workout. 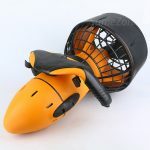 You could also bring a small, electric blade grinder which might be justifiable if you’re brewing for several people, or going for a long trip where you’ll make frequent use of it. 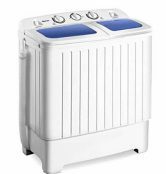 # An immersion boiler is a portable water heater that plugs into a standard outlet (car adapter versions also exist) and gives you hot water wherever you have electricity. Some hotels have hot water dispensers, but some don’t, so this is nice to have if you’re staying in a low-budget hotel without many amenities, while also being more efficient than heating up a whole kettle for just one cup. # A good travel mug is perfect for keeping coffee or tea hot on a cold day, while also providing the under-appreciated advantage of keeping water cold on a hot day. I don’t have a favorite, but I like this one quite a bit, partly because it has a built-in, removable tea infuser so that it can be used for just about anything. "Oomph" is a portable coffee maker that is designed to brew consistently awesome cups of coffee, anywhere anytime. Not every car can be a Fiat with its built-in coffee maker and dashboard light that coddles one’s coffee addiction by reminding the driver when it’s time for a caffeine fix. You need coffee equipment that works equally well at making straight-up coffee or perfect espresso. You’ll find that combination in the Aerobie AeroPress. 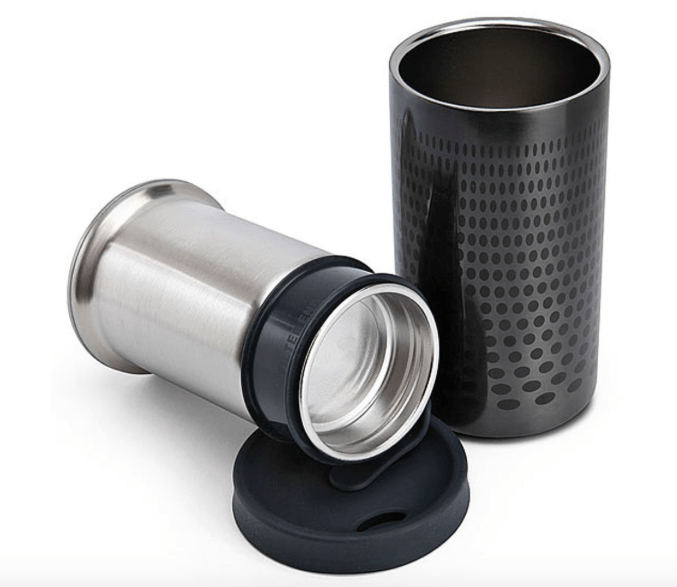 The AeroPress Coffee and Espresso Maker is small, it’s lightweight, and it’s pretty much a godsend for coffee addicts on the road. Carry your coffee and AeroPress filters with you, and all you need is hot water. It will also save you a lot of money when traveling. I bet this thing would pay for itself on the first day of a road trip! The only downside to this car portable coffee maker is that it has multiple pieces. 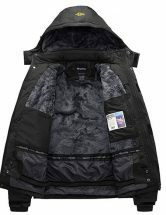 Having that in mind find a case to carry its components in or buy it with its official tote bag if you don’t want to be searching for pieces all over your car. 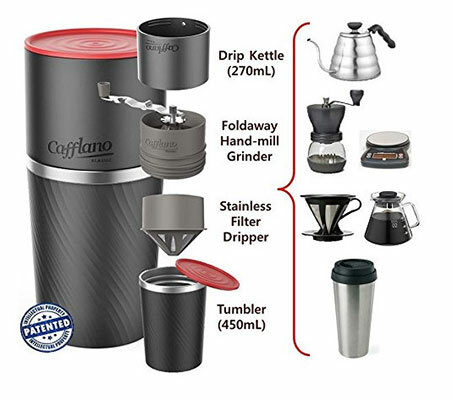 For camping, you should consider Cafflano portable coffee maker. It looks a little like a thermos and is comprised of 4 sections. 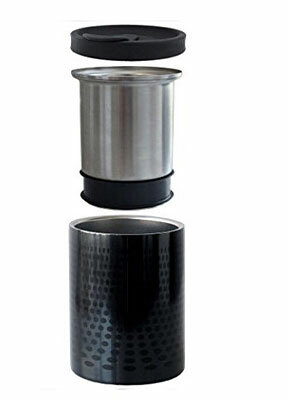 permanent Metal Filter Dripper and an insulated Tumbler, which all screw neatly together for portability. The Cafflano is designed to be used with beans, and these can be transported in the Grinder or Drip kettle. The operation is simple. You just unscrew the components, drop the Filter on top of the Tumbler, screw on the Grinder and add 10/15/20 or 25g of beans. There is a handy measure on the inside wall of the Grinder that’ll give you the increments. You then flip over the handle and crank away. Once you’ve turned the beans to powder, you remove the Grinder, fill the Drip Kettle with 250ml of boiling water, add the detachable lid and trickle on some water. After around 30-45 seconds you pour on the rest of the water and leave to steep. 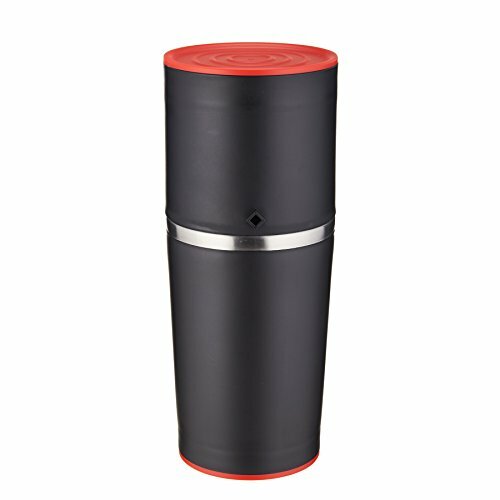 In a few minutes, you’ll have a cup of coffee which will stay warm for a decent amount of time in the insulated tumbler. 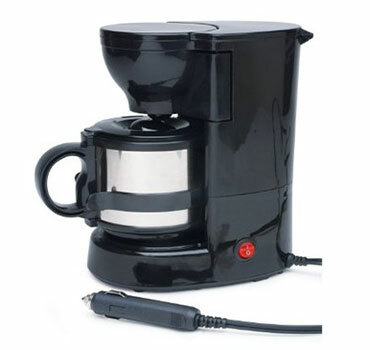 Unfortunately, the choices of battery powered coffee makers in the U.S. are limited. While not truly battery-powered, Roadpro Quick Cup can be hooked up to your car’s power supply. It has its share of issues, including a spill-happy cup, so it’s best used for brewing only, with coffee poured into another container to drink. Of course, it’s not all bad as this little gadget has an affordable price, and it can deliver up 16 piping hot ounces of coffee for your drinking pleasure. Just be careful not to spill it on your lap while driving! The wrap-around band on the Roadpro that holds the cup in place, though, puts this battery operated coffee maker a cut above the rest. 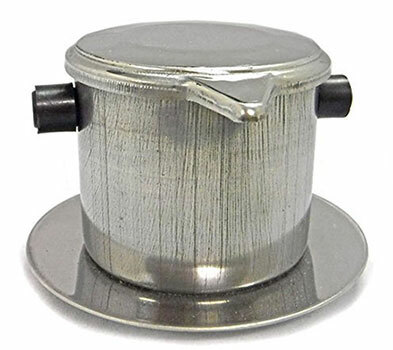 Camping, at the office, or traveling by car, a Vietnamese coffee filter set is a top-notch solution for portable coffee making. It is simplistic, small and lightweight. Somewhere between the GSI collapsible drip and the AeroPress. The Vietnamese coffee filter has become a go-to coffee maker for anyone who wants to make great coffee, regardless of location. 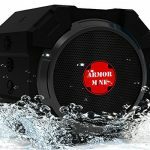 It seems to have the most affordable price compared to the other options, and it is very portable. You can even use it at home on a regular basis. When you buy one of these sets, you get several stainless steel pieces. It includes the saucer, the brew chamber, the insert press, and the lid. It also has rubber handles, so you do not have to worry about burning yourself when trying to make coffee. With just a few simple ingredients, you can brew your own coffee, even when traveling. For those venturing through popular places and enjoying the fantastic espresso on every street corner, this might not seem like a big deal. But for those attending some business conference in a small town for whom the term “coffee” consists of little more than black tap water, a portable coffee maker can make a wonderful difference.